Alpha Math Learning is a local Wilmette math tutor offering private instruction for students that are interested in sharpening their math skills. Alpha Math Learning is owned and operated by Mr. Patel. Mr. Patel is certified with the Illinois State Board of Education and American Tutoring Association. As a local tutor and private instructor in Wilmette, Alpha Math Learning is familiar with the curriculum's adopted by all of the local school districts for all grade levels. We maintain working relationships with many teachers in the local school systems, as communication with private tutors such as our selves and our existing clientele's teachers, is welcome by the School District. Most parents realize the importance of providing a solid foundation for their child's education. This is why Alpha Math Learning offers local math tutoring programs in Wilmette, IL 60091. We specialize in standardized test prep Math for ACT, PSAT, SAT; SAT-Math Level 1 and SAT-Math Level 2 subject tests and Algebra-I. If you are seeking a local home schooling instructor in Wilmette, IL 60091 to assist your student in furthering their education and math skills, then we can help. Contact us today to discover our flexible and affordable math tutoring programs for students local to Wilmette, IL 60091. In 2007, Willamette was ranked as the seventh best place to raise children in the U.S., according to Business Week. 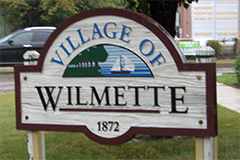 In 2015, Wilmette was ranked the best place to live in Illinois based on a variety of factors including its low unemployment rate, median income, low housing vacancy rate, high education expenditures per student, low crime, and short commute times. Avoca School District 37 includes Marie Murphy School, which has the longest school day in the state of Illinois. Public high schools serving grades 9 to 12, Wilmette students attend New Trier High School. High school freshmen attend classes at the Northfield campus while other grades attend the Winnetka campus. Wilmette is also home to Catholic high schools Loyola Academy and Regina Dominican High School. Arlyn School is an alternative school supported by member school districts in the area. It serves junior high and high school students who have been referred by school districts, community agencies, private practitioners, and parents.